KAHULUI -- Holding Hawaiian flags and waving to passing cars, scores of protesters gathered at Kahului airport this morning to demonstrate against a federal court lawsuit that threatens to take away state programs benefiting native Hawaiians. Some 250 demonstrators were busy in various locations, waving flags and signs or passing out handbills, informing travelers about the protest. Blossom Feitera, an organizer, said the demonstrators are working in three-hour shifts and the number of total protesters was closer to 500 people when counting the number of protesters who came and then left for work. At least double that number is expected tomorrow, Feitera said. The protest did not seem to be affecting flights and airport operations. waving flags and signs or passing out handbills. A number of demonstrators were upset about the state-designating areas where they could stand to hand out leaflets. Rectangles, 1 foot wide by about 3 foot long, were marked in gray tape at six locations close to the drop-off zones for travelers. No one was allowed to distribute handbills inside the terminal. 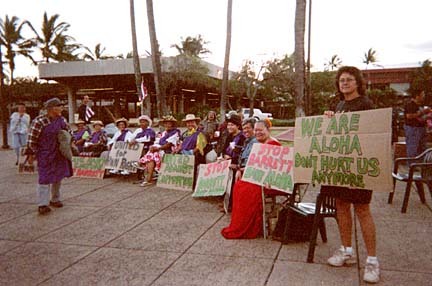 Several protesters said it prevented them from effectively informing travellers about the demonstration, and they disliked the idea of the state imposing rules on ceded lands that were held in trust in part to benefit Hawaiians. "We were offended by it," said Lilyana Ko. "How can we educate the people? We're not even seen." State transportation spokeswoman Marilyn Kali said the protesters were given the same designated areas as other groups requesting to hand out information to travelers. Kali said airport officials kept protesters away from crosswalks and baggage areas for safety reasons and to make sure the protest did not interfere with operations. She said administrative rules also forbid singing, chanting and dancing in the airport area. Illinois resident Henry Pillinger, who received a brochure, said he is accustomed to seeing demonstrations in his hometown of Carbondale. He said the protests serve a purpose. "It educates people on issues," Pillinger said. Isabella Kaihi took the day off to participate because of the suit's potentially impact upon native Hawaiians, including her family. "My heart is in it for the people and for the future," said Kaihi, 32. Demonstrations are planned until 8 p.m. today, 5 a.m. to 8 p.m. tomorrow, and noon to 8 p.m. Sunday.